RFP sequence, based on E1010, with the number of possible pyrimidine dimer-forming sites reduced to the maximum possible extent. To generate this RFP variant with enhanced mutation resistance, we made synonymous codon substitutions to the commonly used E1010 RFP sequence in the registry. These sequence modifications were performed by a computer algorithm developed by the Vanderbilt 2015 team. The algorithm removed sites that, upon UV irradiation, could possible form pyrimidine dimers, including CT, TT, CC, and TC base pairs. Each pyrimidine dimer sequence hotspot was assigned a weight corresponding to that particular hotspot's mutagenicity. These weights were taken from previously published quantum yields of each photodimer, as determined by HPLC-MS/MS (Douki 2013). 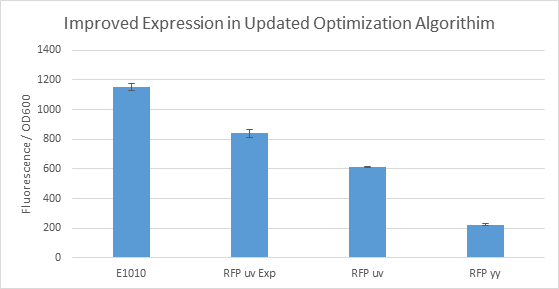 Overall, our optimization algorithm was able to reduce the UV-mutagenicity score by 35% relative to the original E1010 sequence. 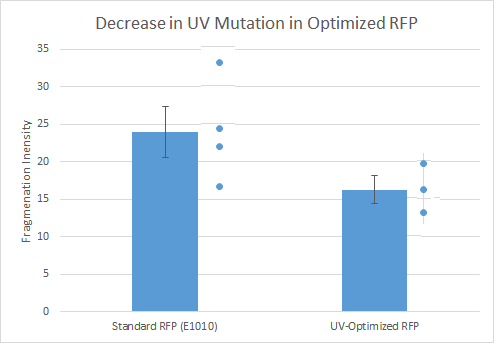 As shown on this graph for data using K1673010, which has only a 12% reduction in UV-mutagenicity score, there is a clearly detectable decrease in the rate of pyrimidine dimer formation following UV irradiation. We also independently verified our finding that K1673101 experiences less mutation using quantitative PCR (qPCR) . We first verified that levels of mutation directly correlate to the sequence's ability to be amplified by qPCR, and compared the amplification of E1010 and K1673101 before and after irradiation. The difference post-irradiation was much greater for the control sequence, indicating proportionally more pyrimidine dimers formed. We first check for the successful integration of our synthesized sequence for K1673101 first by restriction digest. A band was produced at 2.8 kb, as expected for the sequence in pSB1C3. 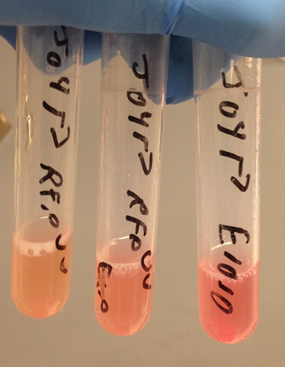 We then sequenced the gene from the forward and reverse ends using VF2 and VR primers. This sequencing conclusively determined that our optimized sequence was present and in the correct orientation. During the algorithmic optimization process, codon-usage frequencies were factored in to which nucleotide substitutions to make, When placed under the R0010 IPTG-inducible promoter, our cells visibly fluoresced red. 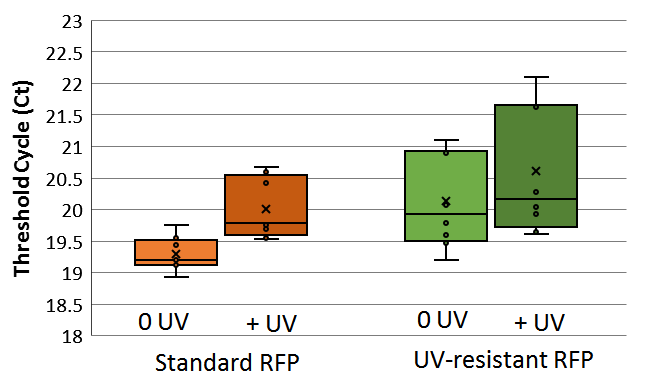 To check that our mutation-optimization procedure did not disrupt expression compared to the codon-optimized sequence, we measured fluorescence intensity at 645 nm with multiple replicates. As shown on the graph below, K1673101 (labeled as RFP uv) has about 60% as intense expression as E1010. We later improved our performance with the sequence K1673102. Douki T. The variety of UV-induced pyrimidine dimeric photoproducts in DNA as shown by chromatographic quantification methods. Photochem Photobiol Sci. 2013;12(8):1286-302.